Philippine democracy has reached a critical crossroads. The Supreme Court has recently granted the quo warranto petition ousting Chief Justice Maria Lourdes Sereno from our nation’s highest tribunal. As all of us take stock of this historic decision, we will do well to reflect on how we should respond as responsible and conscientious citizens. Many legal luminaries have pointed to the deleterious effects of this decision on our democratic institutions. 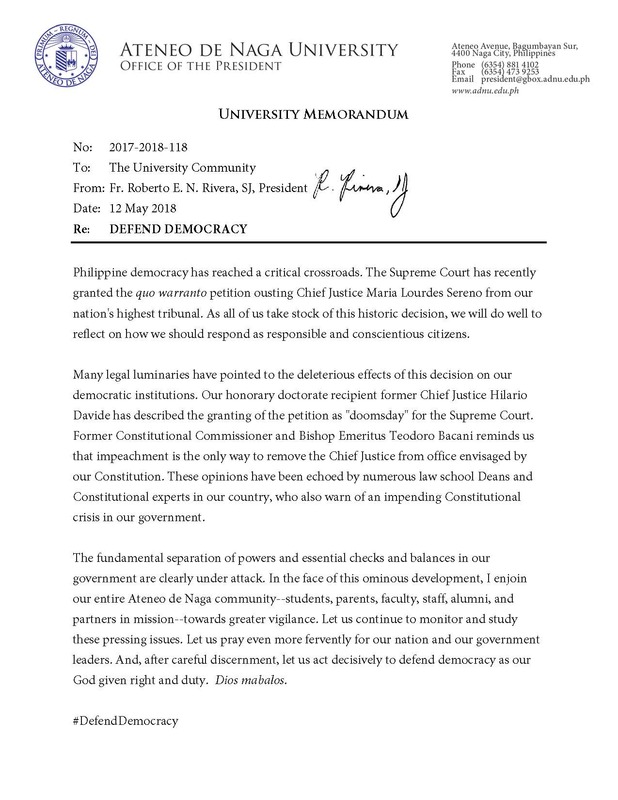 Our honorary doctorate recipient former Chief Justice Hilario Davide has described the granting of the petition as “doomsday” for the Supreme Court. Former Constitutional Commissioner and Bishop Emeritus Teodoro Bacani reminds us that impeachment is the only way to remove the Chief Justice from office envisaged by our Constitution. These opinions have been echoed by numerous law school Deans and Constitutional experts in our country, who also warn of an impending Constitutional crisis in our government. The fundamental separation of powers and essential checks and balances in our government are clearly under attack. In the face of this ominous development, I enjoin our entire Ateneo de Naga community–students, parents, faculty, staff, alumni, and partners in mission–towards greater vigilance. Let us continue to monitor and study these pressing issues. Let us pray even more fervently for our nation and our government leaders. And, after careful discernment, let us act decisively to defend democracy as our God given right and duty. Dios mabalos.